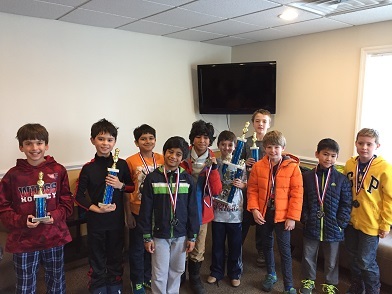 This Sunday, 36 players competed in our monthly K-12 Scholastic Championship. A third of the players were in the K-2 section. In his first rated tournament, Conor Filip won two of his four games and came in fourth place. 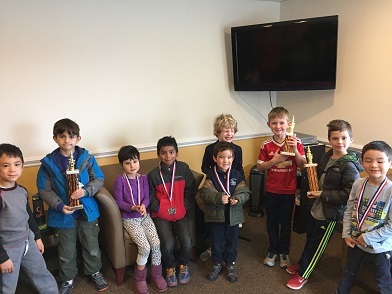 Anthony Low, Levi Feldman, and Arjun Leih all won three of their games; they came in fourth, third, and second place, respectively. CCFC regular, Max Meister, played a perfect tournament, winning all of his games and clinching first place. The K-5 section also hosted 12 players. Anika Bhat, with two points, came in fifth place. Jackson Gerardi and Mateusz Zalewski placed fourth and third, respectively. Hugh Kramer came in second and Quinlan Hood, winning all his games, came in first place. Finally, 12 players competed in a very competative K-12 section. John Weigand, Xan Meister, and Max Ingargiola all won two of their three games; they placed in fifth, fourth, and third place, respectively. Jack Klein and Nicholas Kurbanov both played flawlessly, winning all of their games. Jack came in second and Nicholas placed first. Congratulations to all the winners and thank you to all the participants. We hope to see you all again soon!